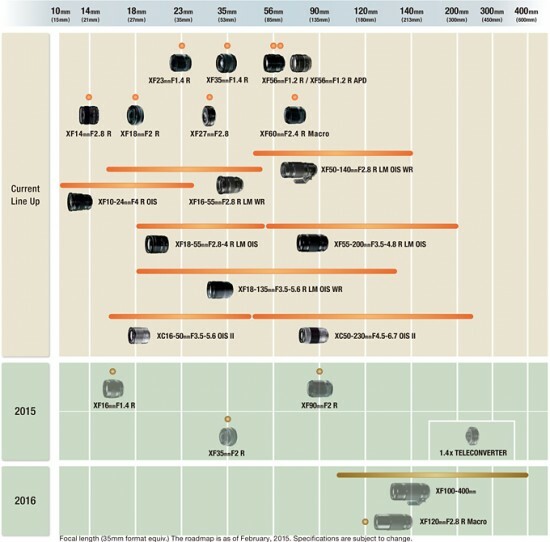 FUJIFILM Corporation has released an updated roadmap for its X mount interchangeable lenses. Highly regarded for their outstanding image quality, resolution and well-built bodies, Fujifilm's unique X mount lens range now has three new additions. The XF120mmF2.8 R Macro is the second macro lens to be added to the line-up. The XF35mmF2 R, with a standard focal length of 53mm*, is a much anticipated addition to the line-up, aimed at photographers who will appreciate the smaller size and lighter weight. The 1.4x Teleconverter is the first of its kind for the X mount and can be attached to other Fujinon X mount lenses** to extend the focal length by 1.4 times.